Now I know that worldwide, New Zealand is known for its kiwi bird. New Zealanders are so enamored of the humble kiwi that we use the name to refer to ourselves (Kiwis) and as an adjective to describe our stuff (Kiwi kids, Kiwiana). But there's another bird here that Kiwis are just as fond of, that few foreigners have heard of: the pukeko (pronounced poo keh ko). Not unique to New Zealand, according to Wikipedia the pukeko is also called the purple swamphen. This name is only party accurate. They are commonly seen in swampy areas, but most people will agree that they are predominantly blue, not purple. In local stores pukeko compete fiercely with kiwi for retail dominance. At souvenir shops you'll see almost as much pukeko merchandise as kiwi. And crafters and artists find inspiration in these little blue guys as well. 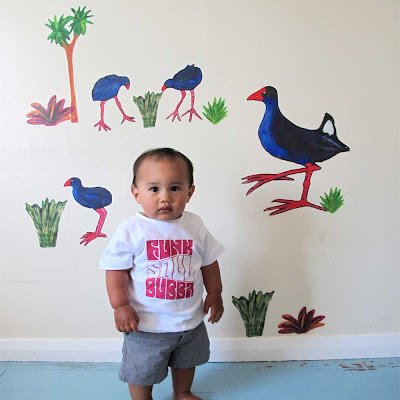 Our own Kim of Stickytiki sells these gorgeous reusable fabric wall stickers, so everyone can have a friendly pukeko in their home. 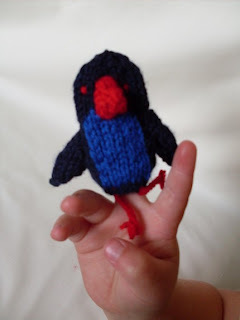 And one of our new Friends of New Zealand, Christine of My 2 Monsters, has a cute little pukeko finger puppet available at her new Etsy shop. So make yourself a little more Kiwi by getting yourself a pukeko! You've reminded me of one of my kids' favourite book series - "Perky the Pukeko" - very kiwi kid! I'm off to search the bookcase! Great post Kya. Love the pukekos! 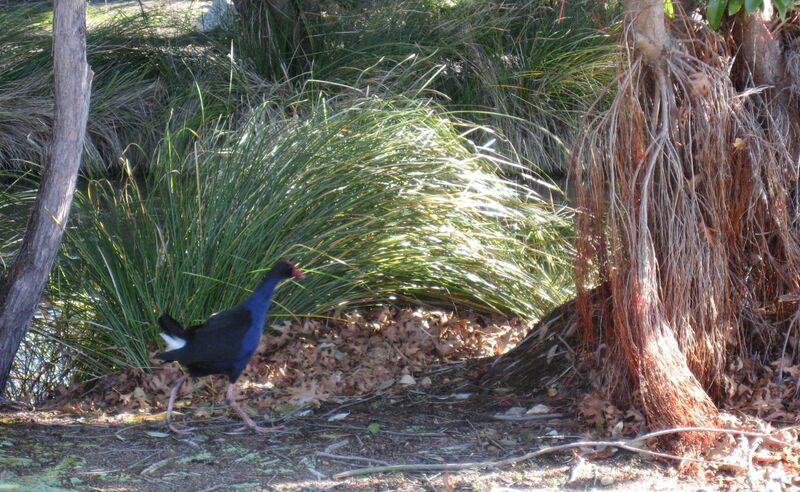 I love all these Pukeko images... great post.